My mum taught me to sew from about 8 or 9 years of age. 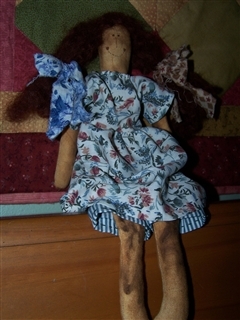 Before I was 10 I remember I had sewn clothes for my large standing doll and around 10 I had sewn shorts and a skirt for myself. I haven’t been quite so young with my girls(though I know children who can do this even younger). 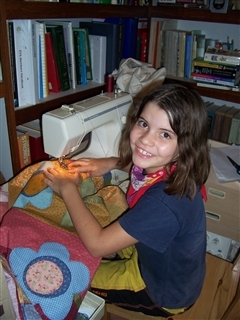 Learn to use the machine – I gave the kids lined paper and no thread in the needle. They had to sew on the line – an unthreaded needle will just poke holes in the paper. 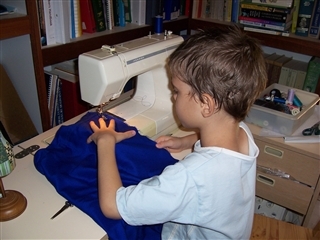 The idea is that they learn to control the machine and sew where they want to sew. They skipped 2 lines in between each ‘stitched’ line, filling up around 10 sheets of paper until I could see their control was good. At this point I gave them a lesson on the machine and how to look after it. I didn’t do this first because they just wanted to ‘get into it’ and theory is rather boring! So once I showed them how much fun using a machine was I taught them the responsibility of looking after it. They needed to know all the parts and general maintenance and caution – such as don’t fiddle with the tension, cleaning lint from bobbin, oiling, and changing the needle. We actually changed the needle because working with paper will blunt the needle. Once the children were ready to sew on material I taught them to thread the machine and bobbin – this is now their responsibility. We used 2 pieces of scrap material, about a4 size and had them sew straight lines, following the edge of their foot, down the page. This was to help them get the feel for feeding material through the machine, plus a little more practice at sewing straight edges. Now they are ready to make something! Yay – they are very excited at this point. They will now have the basic techniques and familiarity with instructions – the rest comes with experience. Note: My girls want to use the Overlocker/Serger – but I’m making them wait for that. I want them to have the basic skills first and then I’ll teach them to use the overlocker which is full of shortcuts (though good looking shortcuts!) Basic skills first is my philosophy – regardless of what homemaking skill we are learning. They are all e-books from currclick. If you cannot sew yourself but want to teach your children then these books will be a great start. I would encourage you to do a project with your children – learn yourself as you teach them. Don’t just teach from the books. Once you've mastered the things in these books you'll be able to go to reading sewing tutorials on craft blogs - I love Noodlehead and the many tutorials and links she gives. The more of these little projects we make (or the kids make) the more comfortable they become with the machine and putting things together. Then you are set for dress making. You can get very simple patterns (there are dressmaking for dummies patterns) which help you decipher the pattern/instructions and yet give you good design clothes. Sewing is a lost art these days (though it is making a comeback). Unfortunately, dressmaking isn’t always the cheapest option for building a wardrobe but, it is handy if you want a modest wardrobe. You can either make modest clothes from scratch or alter shop-bought clothes to make them fit your body better. 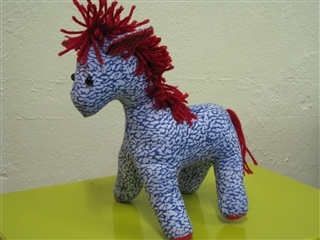 As I said, sewing is making a come back and making gifts and decorating the home are strong influences there.